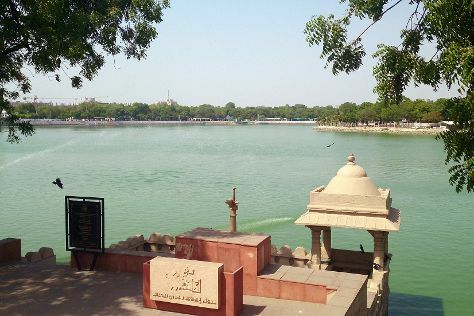 Start off your visit on the 13th (Thu): contemplate in the serene atmosphere at Akshardham, see the interesting displays at Auto World Vintage Car Museum, then contemplate the waterfront views at Kankaria Lake, then contemplate in the serene atmosphere at Jami Masjid, and finally admire the striking features of Sidi Saeed Mosque. Keep things going the next day: take a leisurely stroll along Sabarmati Riverfront, examine the collection at Calico Museum of Textiles, admire the landmark architecture of Adalaj Stepwell, then contemplate the long history of Sabarmati Ashram / Mahatma Gandhi's Home, and finally take in the spiritual surroundings of Hathee Singh Jain Temple. To find traveler tips, other places to visit, maps, and other tourist information, you can read our Ahmedabad online day trip planner . December in Ahmedabad sees daily highs of 34°C and lows of 15°C at night. Finish up your sightseeing early on the 14th (Fri) so you can travel back home.